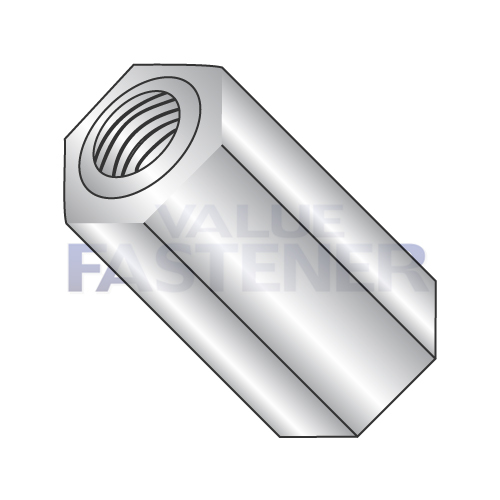 Hex Standoffs are a hexagonal, mechanical device which has a partial or complete internal thread, used to hold two components at a given distance from each other. Hex Standoffs are usually chosen over spacers when longer sizes are required. Hex standoffs can be installed with a nutsetter or other wrenching device. Aluminum is popular for its light weight/ strength compromise. It is non-magnetic, performs well in severe temperatures, and has insulating properties. Brass is used in making high-quality standoffs. It is conductive, resists corrosion, and is non-magnetic. It is costlier and heavier than aluminum and is usually plated zinc or nickel. Steel is used in applications requiring greater strength, but it is heavier than aluminum and does not resist corrosion like aluminum or brass. A hex or round shpaed mechanical device which has an opening with a partial internal thread at one end, and an externally threaded post at the opposite end. It is used to hold two components at a given distance from each other.